I hadn’t worn my favourite gold scarf for a while, so it was time to break it out! I did a high wrap around my bun and then looped the ends around, fastening them in a single knot at the side. I added an antique pin for extra security (doesn’t hurt the eyes, either!) Later on in the day, I added the turquoise sash to add extra interest. For the outfit, I wore a dress that is often hard to match, but lo and behold, has orange, gold and a bit of turquoise in it! I wore a longer, swingy skirt underneath because I was going to be playing cello (aka long skirts are necessary! 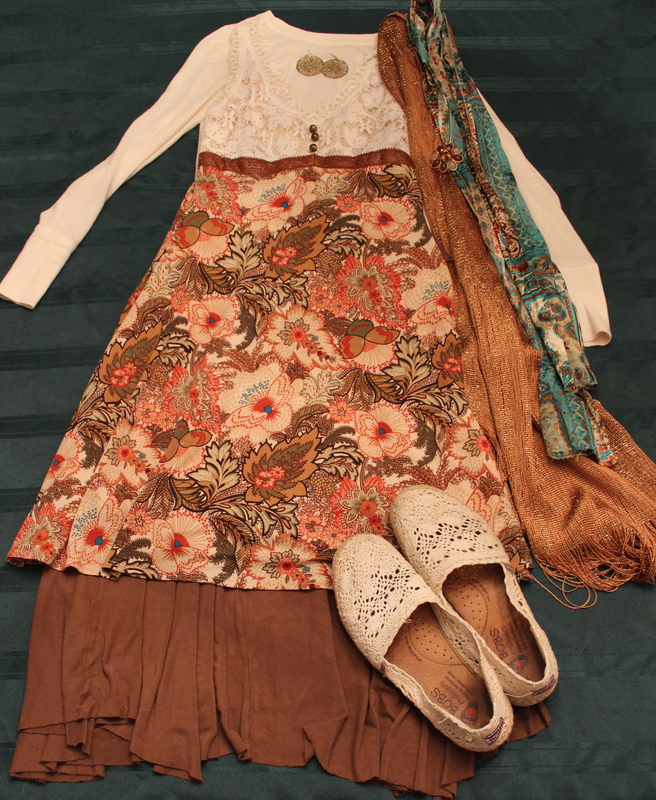 ), an cream shell, gold earrings, and lace flats. All in all, it was comfortable, modest, beautiful, and feminine! 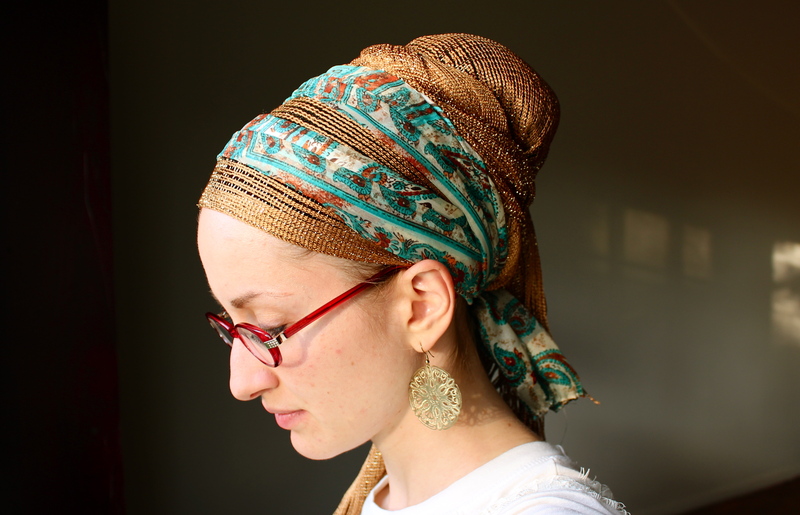 This will likely be one of my new favourite outfit/tichel combos! Your style is beautiful !! How very gorgeous. You must look like a renaissance angel when you play. My daughter Liora ( you know her from sem) says you play amazingly. Love your blog. I am now wearing teichels instead of blah berets. Thanks for your inspiration! I really love all of your creative ideas. Thank you for all the chizzuk! I love it ! Gorgeous ! Am loving this new outfit post! I LOVE the WHOLE outfit!!! The dress is so beautiful!!! Love the glasses. The whole combo is wonderful! I love how you mix the colors you always look so beautiful! Wow, what a beautiful, stunning combination! I can see why its a new favorite! I love the style. stunning! i’d love to dress modestly using patterns and prints. i generally wear solids. you’ve piqued my inerest…off to shop for a patterned dress! I love it too! Thank you!